That's what the Time Magazine cover story asks. My answer: maybe. 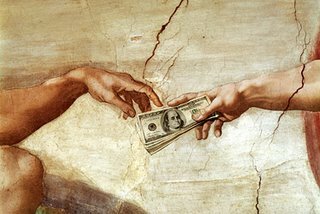 It's no wonder that the prosperity gospel is back in style: it's all about me, baby. God wants ME to realize MY DREAMS because God loves ME and wants MY HAPPINESS. People like a religion that promises good health and massive wealth. Another reason why this theology is popular: it's a pretty sweet deal for the preacher. Check out the personal fortunes of these preachers and you'll want to puke. It's an abuse of the call. When pastors preach sermons "about how gratitude can 'save a marriage, save your job [and] get you a promotion.'" they should consider doing so while wearing fire retardant suits. Honestly, no matter how positive the words that TD Jakes, Joel Osteen, and Creflo Dollar preach might seem, I believer their message is neutered because of their lifestyle. "I'm dreaming big--because all of heaven is dreaming big. Jesus died for our sins. That was the best gift God could give us." OK, I'm not sure how heaven = dreaming big. Maybe that's the Message Bible or some new, hip translation of Revelation 21. Still, you could say this and I'd be fine. "But we have something else. Because I want to follow Jesus and do what he ordained, God wants to support us. It's Joel Osteen's ministry that told me. Why would an awesome and mighty God want anything less for his children?" So because we follow Jesus God's supposed to give us stuff? That would be nice except that it's not Biblical at all. As long as you overlook Matthew 8:19,20; Matthew 6:19-21; Like 12:15-21, and a slew of other texts that go against this, then you're pretty safe to make the case. Here's the point: it's not evil to be rich, just like it's not a curse to be poor. We need to be good stewards of whatever God has blessed us with and not expect Him to "give us our due" just because we trust in Him. So does God want you to be financially rich because you're Christian? No. But does He want you to be rich when it comes to the immeasurable blessings that surround our decision to accept His grace? Of course.